rotary nozzles Archives - Bob Irsay Irrigation Design, Inc.
Smart irrigation products prevent over-watering and water waste, such as running sprinklers in the rain. Although the summer rains have finally come, providing much needed relief from the heat and dry conditions of earlier in the year, South Florida homeowners can help their lawns thrive and spend less money watering their yards with efficient irrigation and smart irrigation products. Boca Raton residents can use their boca raton sprinklers less by installing water-saving products like rainswitches and “smart” clocks. Such products can limit overwatering and water waste by keeping people’s sprinklers from running after sufficient rainfall. Leading sprinkler companies in the South Florida region like Bob Irsay Irrigation Design, Inc. help South Florida customers irrigate their yards intelligently. 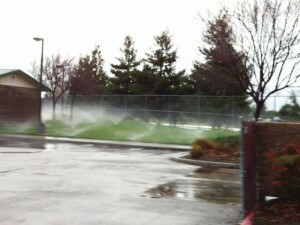 By cutting down on water waste like overspray onto hardscapes, these businesses can adjust customers’ sprinkler systems to water only where needed and as much as necessary. Bob Irsay Irrigation Design offers a number of smart irrigation south florida products and services to improve the efficiency of customers’ irrigation systems. Watering one’s lawn during or after rain represents one of the more egregious examples of water waste. Bob Irsay Irrigation Design can retrofit many sprinkler systems with rainswitches. These threshold devices prevent customers’ sprinkler systems from running if the device registers a certain amount of precipitation, such as half an inch of rain. To work properly, these devices should be installed in areas where they have a clear path to the sky. Other “smart irrigation” products include specialized sprinkler heads, rotary nozzles, in-ground moisture sensors and “smart” controllers. Consumers can opt for heads with “seal” features and pressure regulators. These heads automatically prevent water from gushing out if the heads get broken. Rotary nozzles provide more efficient watering than standard nozzles, delivering water at higher precipitation rates. In-ground moisture sensors communicate with sprinkler controllers to keep given sprinkler zones from running if these zones have enough moisture. Smart controllers adjust irrigation watering automatically to water only as much as needed, taking into account various weather conditions. To learn more about any of the above-mentioned products or services, please contact our office. This entry was posted in Blog, Boca Raton Sprinklers, Smart Irrigation Products and tagged “seal” features, “smart irrigation” products, “smart” controllers, adjust irrigation watering automatically, Bob Irsay Irrigation Design Inc., Boca Raton residents, Boca Raton sprinklers, dry conditions, efficient irrigation, egregious examples of water waste, heat, help South Florida customers, help their lawns thrive, higher precipitation rates, improve the efficiency, in-ground moisture sensors, irrigate their yards intelligently, irrigation systems, leading sprinkler companies, limit overwatering, much needed relief, overspray onto hardscapes, pressure regulators, rainswitches, rotary nozzles, smart clocks, smart irrigation products, smart irrigation south florida, South Florida homeowners, South Florida region, specialized sprinkler heads, spend less money watering their yards, sufficient rainfall, summer rains, water only where needed, water waste, water-saving products, watering one’s lawn during or after rain on 06/09/2016 by jason.